CRAZY DISCOUNT! Was: $599.95 Now: $329.95! Soothe tight and painful muscles anywhere on your body and start the journey to better health with this electric massage device. Adopting state-of-the-art technology with powerful high-torque motor, this massage machine offers a thorough deep tissue massage for your uncomfortable and troublesome areas. 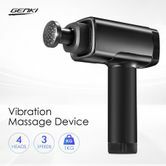 The vibration massager features 3 speed modes and 4 massage heads, providing a great chance to customize your massage experience. The percussion of this handheld massager can be reached up to 3,200 in every minute, giving you a comfortable experience to relax your muscles after a long day work. Its lightweight and portable design allows for convenient use while you are staying at home, working in the office or travelling outside. Advanced technology with powerful brushless high-torque motor providing a deep percussive. Massage to reduce muscle and joint pain, improve mobility, help relieve muscle fatigue, soreness, spasms and stiffness.